I f you are starting a ride why not send the details, using the form below, to add it to the Calendar . . . clicking a date on the Calendar will show just who is on the road at the same time. The system is semi-automatic, your ride will usually be in the calendar within 24 hours of submission. The Calendar retains ALL rides since Cycle : End-to-End went live in April 2009 . . just scroll back through the calendar to find them. The "rides calendar" only lists ride dates and brief comments ... blogs/journals etc can be added to the Journals listing when the ride (and journal) is completed - and does not list fundraising pages, but will mention good causes. Please, please use the SHIFT key (there's one each side of the keyboard with an upwards arrow!!) - text all in lower-case has to be edited manually and your entry may be delayed!! Thanks. Brief notes to add to the calendar detail - perhaps about yourself? Just to add a bit more interest. 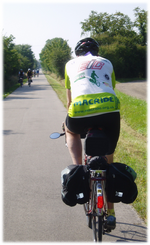 Links to journals, blogs, fundraising etc will not be published in the calendar - BUT do send your Journal after the ride. Give your ride a name to list in the calendar - somehting a bit more specific than just "LEJOG" or "JOGLE" to differentiate YOUR ride!